When you feel it's too lame to eat at a very mainstream food chain, you will seek for an alternative. That is exactly what was in Pizza Hut R&D department's thought when they decide to open The Kitchen. "We try to grab back our customers with all back-to-basic menus," said Elizabeth. The Kitchen seeks to impress younger customers, especially middle-up young workers. What makes them very different to Pizza Hut is the cooking time. When usual Pizza Hut needs 17 minutes to be served, The Kitchen offers new experiences with faster time: 5-7 minutes. “Customers will have faster lunch and get back to their offices on time. They will have extra time for socializing with friends when having lunch,” said Elizabeth. Arriving at The Kitchen, customers will see a long display counter where they can queue to order varieties of dishes. When choosing the dishes, customers can see the cooks’ activities in the open kitchen. “Having an open kitchen means that we are ready to show customers our best effort to serve good food. From this kitchen, customers may see our cooking process. We are showing them that we use fresh ingredients and cook it properly,” said Elizabeth. This diner offers various basic pizzas such as Pizza Margherita, Pizza Hawaii Aloha, Pizza Salami Jalapeno, Pizza Bratwurst and Pizza La Gourmet. When the biggest pizza at Pizza Hut has 14 inches diameters, The Kitchen’s Pizza have only one size of pizza with 18 inches diameters. Customers may select their pizza per slice (Rp33,000) or per pan (Rp198,000). Along with pizza, pasta also comes with basic sauce. There are Beef Lasagna, Spaghetti Aglio Olio, Spaghetti Beef Meatballs, Fettucine Pesto Bratwurst, and Fettucini Alfredo. The Kitchen also serves side dish such as Cheesy Macaroni, Tortilla with Salsa Sauce, to Sausage in The Blanket. When Pizza Hut is renowned for their salad bar, The Kitchen serves portioned salad with various types and sauces. There are Caesar Salad, Green Salad, Fruit Salad and Potato Salad. Completing all of them, there are four types of bruschettas which are Bruschetta Sunshine, Bruschetta Ala Mama, Bruschetta Cherry Tomatoes, and Bruschetta Champignon. To wash down all of the food, The Kitchen offers house-made fruit juice drink with refreshing and delicious flavours such as Orange, Green Veggie, Apple Melon, Carrot Mango, and Raspberry. Customers with sweet tooth can also enjoy The Kitchen’s selections of desserts such as Scone with Ice Cream, Ice Cream Neapolitana, and Fruit Parfait. 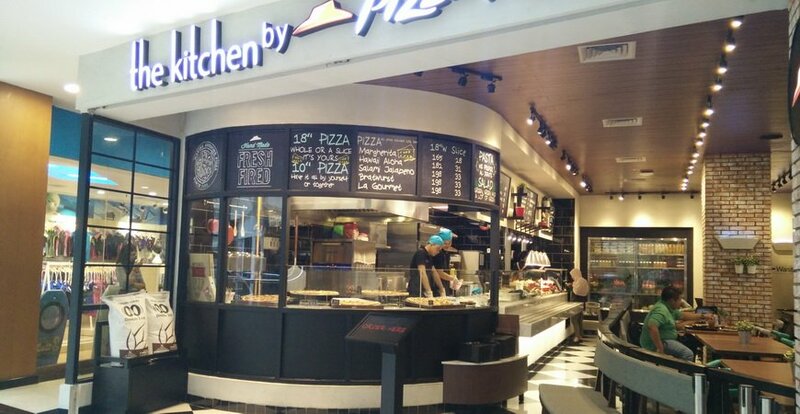 Opened in 12 October 2015, The Kitchen by Pizza Hut is the first premium outlet of Pizza Hut. This restaurant is located at Pondok Indah Mall II 3rd Floor, Unit 317-319.